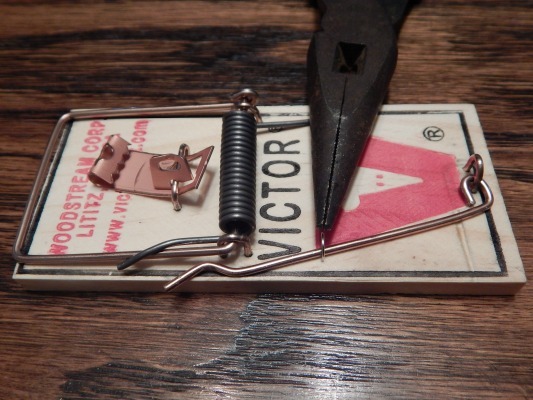 Learning how to set a mouse trap is not hard, but it does take steady hands and a big dose of self confidence. 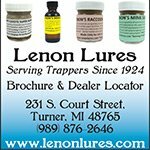 Wooden snap traps are the most common and cost effective mouse traps on the market. They're cheep, relatively easy to set and they work really good for trapping mice. However, the major problem with the wooden snap trap is the possibility of catching your fingers while setting the trap. Although the trap is not powerful enough to seriously injure you.......it's definitely going to leave a mark! 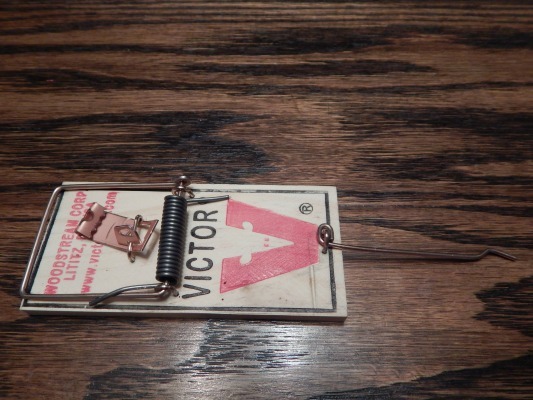 Snap traps are now manufactured by several different companies but Victor mouse traps are the most common and widely used. 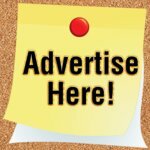 They can be found at your local grocery or home improvement store and can be purchased in a two pack for just a couple dollars. 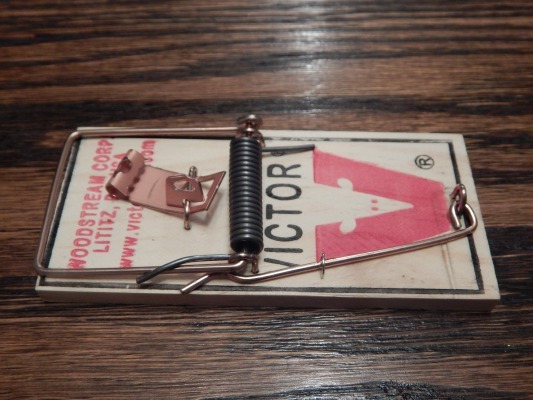 Since the traps are so cheep, many people choose to just throw the trap and dead mouse away after a successful catch. Or, if you don't mind having your hands near a dead mouse, you can simply hold the mouse trap over a garbage can and lift the spring loaded kill bar up to release the mouse. 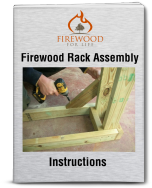 When you remove the trap from the packaging you'll notice a small staple holding the arm bar to the wooden base. Remove the staple using a pair of needle nose pliers or small screw driver. Once the staple is removed, take the arm bar and hang it back off the trap as shown in the picture below. Next place bait on the metal bait pedal. You have a few different options for bait but peanut butter works the best. Mice love to eat peanut butter and the peanut butter sticks easily to the bait pedal. Sometimes you will run into an educated mouse that's able to eat the peanut butter off the bait pedal without triggering the trap. If this is the case, loosely wrap and tie some dental floss around the bait pedal then spread the peanut butter over the dental floss and bait pedal. 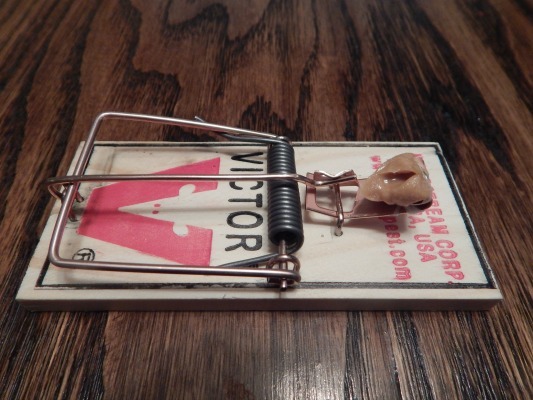 Mice will eat the peanut butter and their teeth will get tangled in the dental floss causing more resistance on the bait pedal which will trigger the trap. It's a little secret that works great! 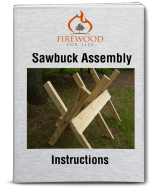 Once the trap is baited, carefully pull back the kill bar and hold it securely to the wooden frame. Placing your thumb on the corner of the kill bar seems to work the best and reduces the possibility of snapping your finger. Now, take the arm bar and place it under the notch in the bait pedal. This part is tricky. You need to let a little pressure off the kill bar which helps hold the arm bar in the bait pedal. It might take you a few times to get the hang of it. Once the arm bar is seated in the bait pedal notch, quickly move your hands away from the trap. Make sure not to have any fingers in the way of the kill bar in case the trap goes off. 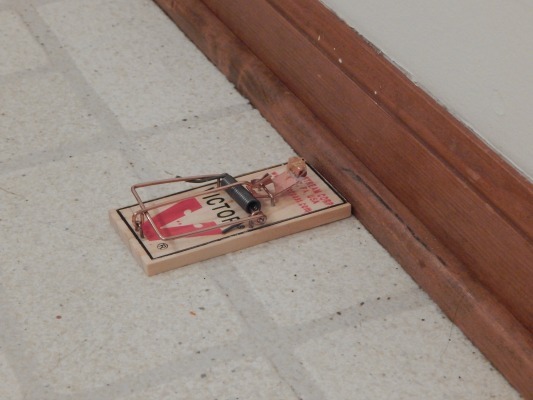 Once the trap is set, place it adjacent to a wall where you have noticed mouse activity. Mice typically don't run across an open room. They will travel along walls, behind large objects or in tight spaces. Remember, a snap trap is designed to be a kill trap so using one around pets or small children could cause injury. 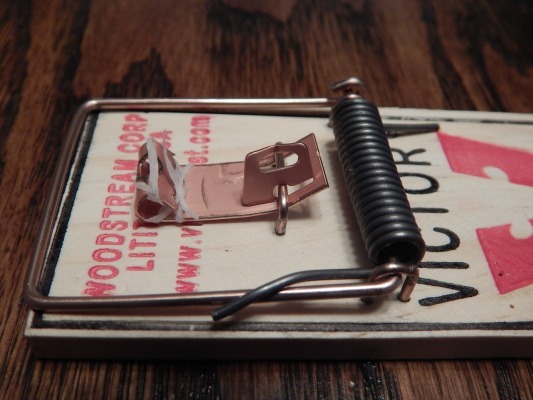 Learning how to set a mouse trap such as a Victor snap trap is not difficult but it can be a little tricky in the beginning. 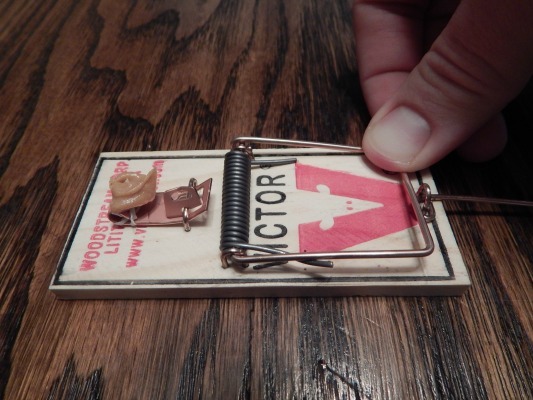 After using the traps a few times you'll become more confident when setting the trap and you'll be able to remove those unwanted mice for just a few dollars.